The two main bridge parts has been improved. The news is a simple system for prevent possible linear bearings slipping out. Now the bearings needs to be inserted by the same side and a small plastic tab has been added. This tab can be melted with a soldering iron or similar once linear bearings has been inserted. They prevent possible bearings slipping out. This is only a minor update for new builds and is not a need. 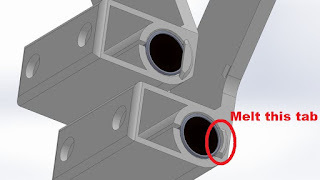 If you notice this issue you can probably melt the existing bearing holes or use some epoxy on the existing holes instead to print the new part. This anti-slippingOut system will be also used on the new carriageV4.